Who doesn’t love a margarita? Frosty, cold, and tart, with or without salt on its rim, it’s a refreshing cocktail unlike any other. The following places are the best in Maine for the margaritas they serve. So, gather your friends and stop by to enjoy one—or maybe even two. Home of the Maine Blueberry Margarita, Loco Coco’s Tacos has several new tequilas in their lineup, so it’s an excellent time to pay them a visit. Order a beef burrito bowl to nibble on as you sip. It’s tasty and spicy, but not overly filling. And that Maine blueberry margarita is to die for! 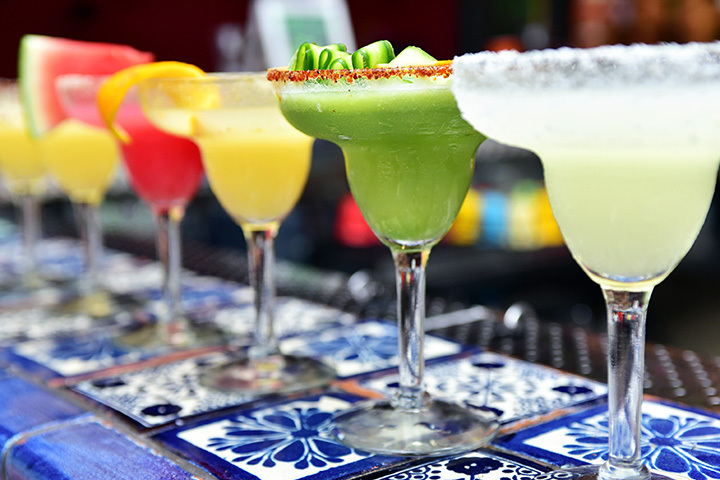 Serving up Portland’s best margaritas, Guerrero Maya is an authentic Mexican restaurant and bar, with live entertainment to boot. It’s the perfect place to sip and unwind after a long week at work! Banditos Mexican Grill is a summer staple in tourist-heavy Ogunquit, and part of the reason is the amazing margaritas they serve. Choose from their Banditos Margarita, Cadillac Margarita, El Jefe Margarita or—for those counting calories—their Banditos Skinny. There’s a margarita for everyone here. Miguel’s is known throughout the mid-Maine area as the place to go to enjoy an exceptional margarita. They feature a few options in addition to their traditional margarita, including El Grande, Cadillac, Sauze Style, and Miguel’s Signature. Try the nachos, too. They’re fabulous! If you’ve never tried a margarita at Taco Escobarr, check them out on Margarita Monday. You’ll receive $1 off their specialty margaritas, including their prickly pear cactus margarita, blood orange margarita, toasted coconut margarita, and more. The cantina at Pancho Villa is well-stocked, and serves up lots of delicious margaritas. Be sure to ask the bartender what’s on special. Indulge in some chips and salsa while visiting the cantina. They’re a tasty way to work up a thirst! A Bangor staple for about four decades, Pepino’s serves exceptional food and even better margaritas. Check out their Margarita Monday for great deals on margaritas. Their margarita menu includes honey jalapeno margarita, gin-rita, champagne margarita, and more. Pedro’s is Kennebunk’s most popular spot for everything Mexican, including some killer Margaritas. Their specialty margaritas include Make It a Flat, Make It a Skinny, and Make It a Classic, and each has delicious variations. Check them out and wet your whistle! The margarita menu may be small, but it packs a mighty punch at Uno Mas Grill. Made with El Jimador Blanco Tequila, it is big, cold, and refreshing! Get some guacamole and chips, too. They’re perfect for munching while you enjoy your drink. Don’t judge a book by its cover. Burrito Betty’s sits on the side of the road on Route 1 in York, and its building has been many things over the years. This is by far the very best ever. Not only are Betty’s burritos spectacular, the margaritas are as well. Stop by and enjoy the regular customers who gather nightly to converse and enjoy a few drinks. Or order a burrito and enjoy your margarita with a delicious meal.